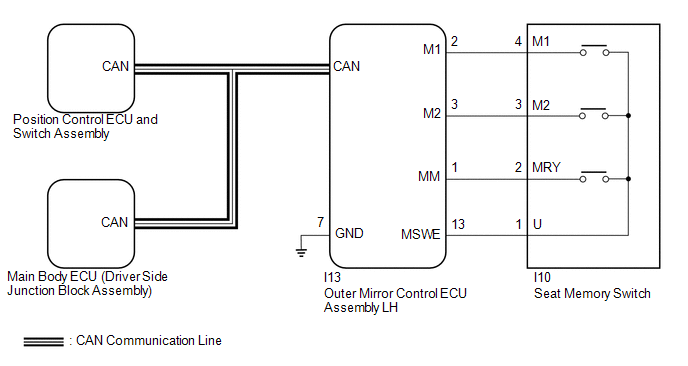 The main body ECU (driver side junction block assembly) receives seat memory switch signals from the outer mirror control ECU assembly LH via CAN communication. 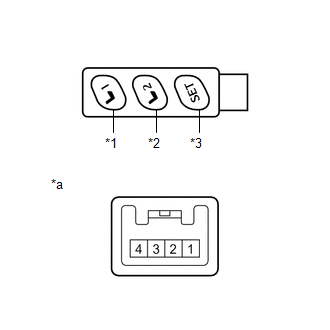 If the seat memory SET switch is being pressed when one of the M1 or M2 switches is pressed, or if one of the M1 or M2 switches is pressed within 3 seconds of pressing the seat memory SET switch, the main body ECU (driver side junction block assembly) sends a memory request signal to the position control ECU and switch assembly. After receiving the request signal, the position control ECU and switch assembly memorizes the location data of each motor. (a) Check that each function of the power seat operates normally by using the position control ECU and switch assembly (See page ). Each function of the power seat operates normally using the position control ECU and switch assembly. (a) Remove the seat memory switch (See page ). (a) Disconnect the I13 outer mirror control ECU assembly LH connector.